Calligraphy (shodo: "the way of writing") is the art of writing beautifully. Most children learn calligraphy in elementary school. It is a popular hobby among adults, too. Shitajiki: Black, soft mat. It provides a comfortable, soft surface. Bunchin: Metal stick to weight down the paper during writing. Hanshi: Special, thin calligraphy paper. Fude: Brush. There is a larger brush for writing the main characters and a smaller one for writing the artist's name. The small brush, however, can be used for the characters, too. Suzuri: Heavy black container for the ink. Sumi: Solid black material that must be rubbed in water in the suzuri to produce the black ink which is then used for writing. Of course, "instant ink" in bottles is also available. Unlike the strokes of Roman letters, the strokes of Japanese characters have to be drawn in the correct order, not arbitrarily. When you learn Chinese characters, you draw one stroke after the other. This is called the square (Kaisho) style of writing kanji. This style of writing kanji, however, is rarely used in everyday life. Instead, there are two faster styles of writing, in which the kanji become a little bit less legible, just like when writing Roman letters in a fast way. These two styles are called semi cursive (gyosho) and cursive (sosho). 最后修改: 8 年, 3 个月 之前 由 dingpuzhao. The Chinese roots of Japanese calligraphy go back to the twenty-eighth century BCE, to a time when pictographs were inscribed on bone for religious purposes. When this writing developed into an instrument of administration for the state, the need for a uniform script was felt and Li Si, prime minister in the Chinese dynasty of Qin, standardized a script and its way of being written. He sanctioned a form of script based on squares of uniform size into which all characters could be written from eight strokes. He also devised rules of composition where horizontal strokes are written first and characters are composed starting from top to bottom, left to right. Because the symbols were inscribed with sharp instruments, the lines were originally angular and in many ways Li Si's achievements were made obsolete by the appearance of brush and ink (see Chinese calligraphy). The ink-wet brush creates a line quite different from a sharp stylus. It affords variation in thickness and curve of line. Calligraphy retained the block form of Li Si and his eight strokes but the writer was free to create characters that emphasized aesthetically pleasing balance and form. The way a character was written gave a message of style. Calligraphy in the Chinese tradition was thus introduced to Japan about 600 CEf. Known as the karayō (唐様) tradition, it has been practiced up to today, rejuvenated continuously through contact with Chinese culture. The oldest existing calligraphic text in Japan is the inscription on the halo of the Bhaisajyaguru statue in the Hōryū-ji Temple. 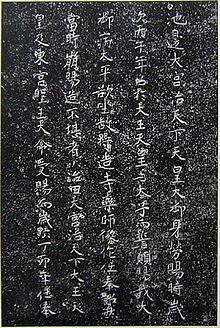 This Chinese text was written in Shakeitai (写経体) style, prominent in the Chinese Six Dynasties period.